Children can climb, hide, crawl and slide on and around the Vibrant Climb and Slide from ECR4Kids. 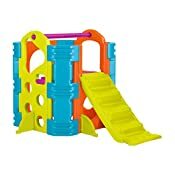 The straight slide reverses and becomes a set of stairs that leads to a platform, and kids can climb through the back door and up to the platform using the stability bar alone. Fade resistant and easy to assemble, the ECR4Kids Vibrant Climb and Slide is great for indoor or outdoor use. It's ideal for use in daycare and preschool environments, with children ages 3 to 7. The Vibrant Climb and Slide measures 66.75 x 33 x 39.75 inches (LxWxH). ECR4Kids Play Structures have achieved GREENGUARD [GOLD] Certification for meeting or exceeding standards for low emissions into indoor air during product usage. With a concentration on the Pre K-12 sector, ECR4Kids offers a wide range of products from tables, chairs and desks to cots, mats and a variety of storage cases in solid wood as well as scratch resistant double-sided laminate.